Heads, Tummies, & Tails: A Smart Guide to Printing Lowercase Letters - Playapy - Playful Solutions. Powerful Results. Heads, Tummies & Tails: A Smart Guide to Printing Lowercase Letters was developed to improve the handwriting of children by providing therapeutic techniques to assist in their learning. One of the most common errors that occur with children’s handwriting is the alignment of letters. This refers to how the letters are placed in relation to each other and also the lines used to assist with maintaining the letters in a straight line. Unlike uppercase letters, which are all drawn from the top and fit inside the same space, lowercase letters vary more and, as a result, are more confusing. In this book, lowercase letters are separated into three groups to help children relate the letters to the lines on which they were writing. In addition, ten action word phrases are used to help a child memorize how to form individual letters. This provides a multi-sensory approach as the child feels the motion of the pencil, hears the words, and sees the strokes as they are being formed into letters. In addition, there is a helpful mascot cheering along as a child works his or her way through the book. This workbook was created to help parents, educators, and occupational therapists. Its concept is smart and effective and should be introduced around 5 years of age when children typically begin learning lowercase letters. It is intended to be completed after its companion workbook for uppercase letters. The separation of uppercase and lowercase letters leads to greater success. The 26 lowercase letters of the alphabet are separated into three alignment groups: Heads, Tummies, & Tails. Lowercase letters that ascend or “touch the top line” are in the Heads group. These are the following 7 letters: b d f h k l t.
Ask Your Child: Which letters touch the top line like the monkey’s head? Lowercase letters that remain at the middle or “mark the middle line” are in the Tummies group. These are the following 14 letters: a c e i m n o r s u v w x z. 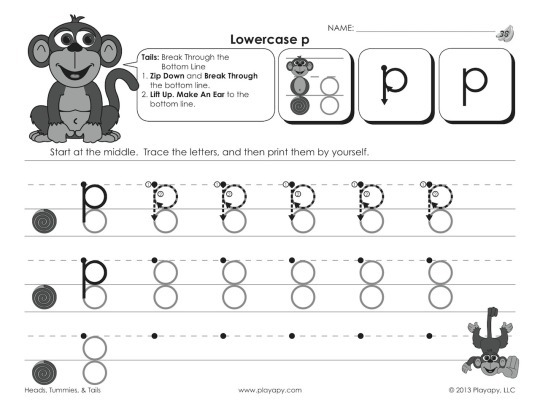 Ask Your Child: Which letters stay in the middle like the monkey’s tummy? Lowercase letters that descend or “break through the bottom line” are in the Tails group. These are the following 5 letters: g j p q y. Ask Your Child: Which letters break through the bottom line like the monkey’s tail? The 26 uppercase letters of the alphabet can be formed using ten simple phrases called Action Words: Add a Dot, Break Through, Curve Around, Make an Ear, Make a Hook Down, Make a Hook Up, Slide Down, Slide Up, Zip Down, and Zoom Across. 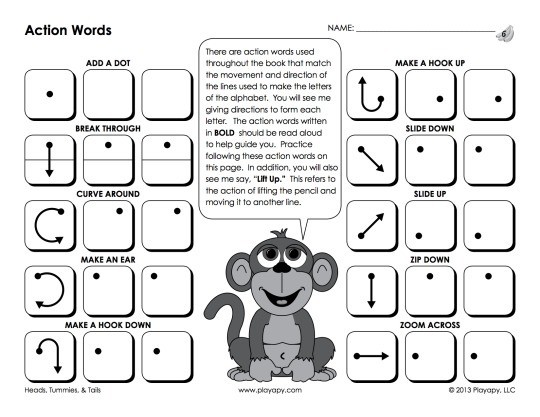 First introduce the Action Words pages. They are used to introduce the language used for the formation of the curved and straight lines. The Coloring Pages are then used as introductions to the different groups. The groups do not need to be completed in the order they are presented. Next, each letter will have a page within a group. Action words printed in bold should be said aloud to guide the child. Using a character voice makes it more fun and encourages the child to say the words as well. There are also alignment circles on these pages that match the placement of the monkey’s head, tummy and tail. They help to encourage proper placement of letters. Lastly, there are additional pages including reviews of the groups, copying words, and activity pages. 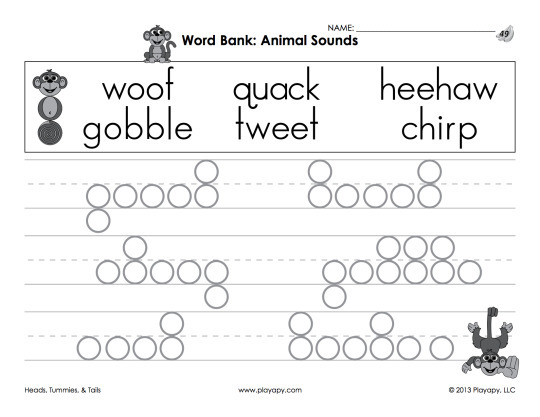 The workbook also includes a visual chart and a guide with all the action words for the 26 letters on one page.